Her favorite time is breakfast time and her granola is out of this world. Born in Seattle to parents who loved serving food from their own garden, Jane learned early on that eating in-season and shopping local does a body good. Jane was always drawn to the kitchen, eager to try new recipes and share good food with good company. In 2008, Jane relocated to Salt Lake City where she worked for five years as a first-grade teacher. She continued to hone her craft of cooking and baking with whole, natural ingredients, while slowly developing her perfect granola. Today, Jane lives beneath the Wasatch Mountains with her husband and daughter, and she still hasn’t met a breakfast that she didn’t like. Named for the supernovas that always caught Jane’s attention, Nova Granola began in 2010 as a search for the perfect granola. As a runner, a teacher, and a whole food junkie, Jane was always on the lookout for quality foods. But she could never find a granola that was as healthy as it was good, or as good as it was healthy. Each bite came up too oily, sweet, grainy or hard to eat. So she set out to make her own. With a family recipe in one hand and a vision in the other, she developed a recipe that used only whole, natural ingredients hand-selected by Jane herself. 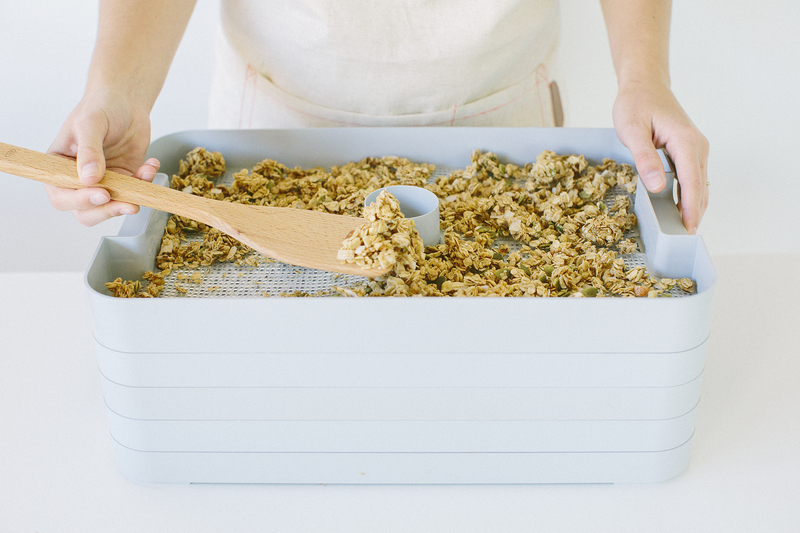 Using a dehydrator for the texture she wanted, she created the granola she had been searching for. And just like that: Nova Granola. Over the next four years, three more flavors were added: Citrus, Mango-Cherry, and Raspberry-Chocolate. Why do you dehydrate your granola? Dehydration is the process of removing water from food. It is done slowly over many hours at low temperatures. This enhances the flavors of all the ingredients and leaves the granola clustery, chewy, crunchy, and delicious! What is the shelf life of Nova Granola? 2–3 months from the date of purchase. For best results, keep sealed and refrigerated. Why would I put my granola in the refrigerator? Moisture is a dried food’s enemy. Dried foods left exposed will absorb the moisture in the air and become limp. This is why we recommend you always reseal your bag airtight; store in a dry, dark place with a moderate temperature; or for best results, refrigerated. What are those green things in Original and Citrus? Pepitas! Which is a Spanish culinary term for pumpkin seed. Is Nova Granola gluten free? Consult with your doctor about your tolerance to rolled oats before eating Nova Granola. Other than that, all other ingredients are gluten-free. Are there artificial ingredients in Nova Granola? Nope! Nova Granola is made with 100% all-natural, whole ingredients. When should I expect my granola to arrive in my mailbox after placing and online order? We make your granola upon receiving your order. You should receive your fresh granola in less than 2 weeks.